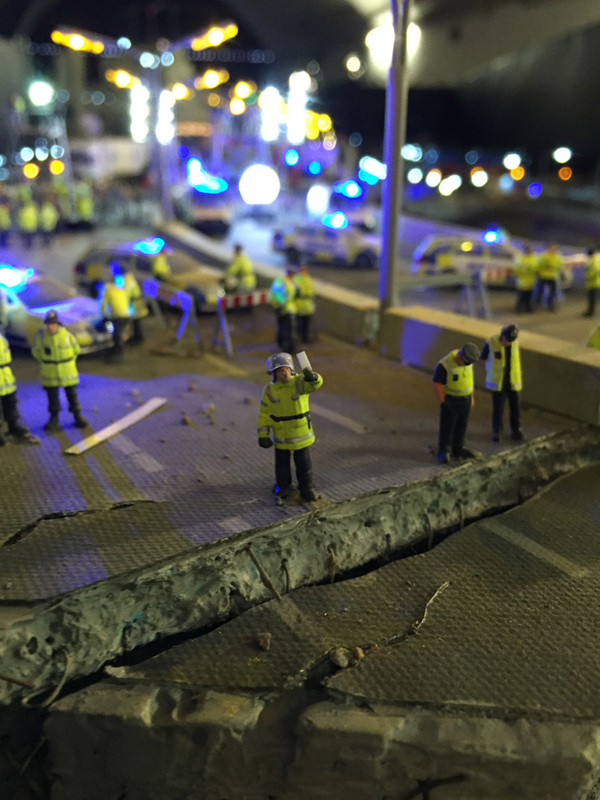 The Aftermath Dislocation Principle (ADP) is an artwork by Jimmy Cauty. The artwork is a 1:87 scale model housed in a shipping container. The model is viewed through observation ports in the sides of the container. The ADP went a nationwide tour of former riot sites across the UK during 2016. The ADP WORLD RIOT TOUR began in 2017 with a mission to visit every historic riot site in the world. This tour will continue until the end of time. 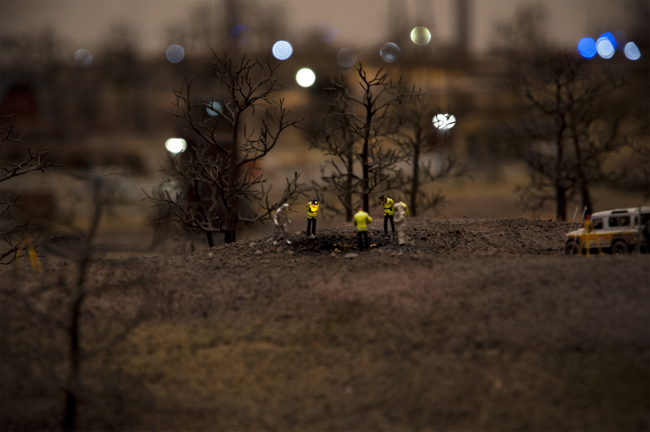 Phase 1 of the Aftermath Dislocation Principle (ADP) model took nine months to make with a team of five full time assistants using traditional model making materials and kits. Phase 1 was completed in October 2013. 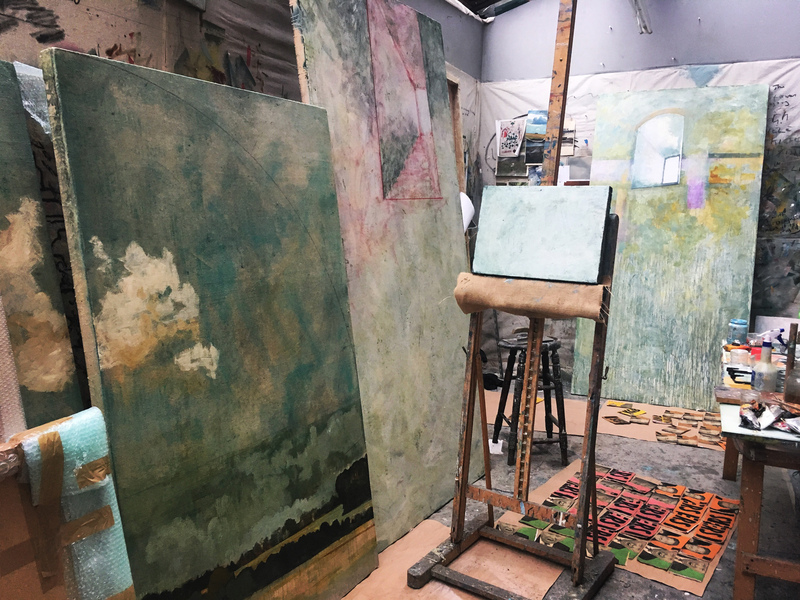 It was first exhibited for 2 weeks in London then toured the Netherlands in 2014. The ADP contains approximately 3000 hand painted British policemen and more emergency vehicles than any real-life policeman has ever seen. Each LED strobe light has been individually programmed so the flashing will always be random and never become synchronised. Everything is at 1:87 scale. Even the sound. Jimmy personally smashed all the windows himself. No one knows what led to this destruction or where all the civilians have gone. Yes, there is a stag on top of one of the high-rise buildings. The ADP model was first shown in gallery spaces and railway arches rather than outside in a shipping container. Back then the ADP was shipped in 23 crates and had to be reassembled each time it was exhibited. 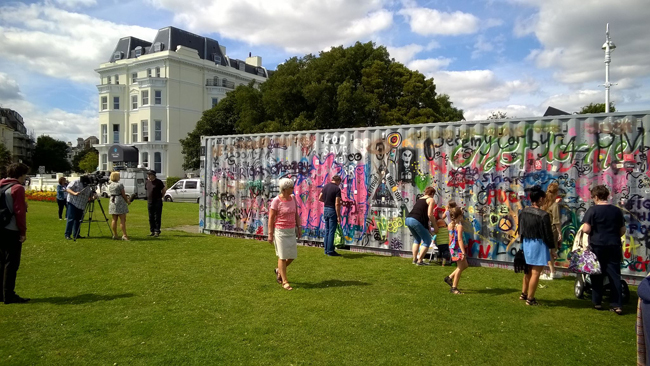 The ADP model was re-engineered as a shipping container based artwork at the beginning of 2016. To fit the ADP model inside the container six inches had to be sawn off its entire length. The ADP shipping container is 40ft long, 8ft wide and 9.5ft high. The ADP now weighs 4.5 tonnes and is moved around the world on 30 tonne lorries and container ships. The ADP can only be conceived of in imperial units. The ADP can be plugged in anywhere and if no electricity supply is available it has its own generator. The ADP power consumption is 2.5kw, 240v, 16amp. The ADP shipping container was originally painted grey with just the ADP logos on each side. 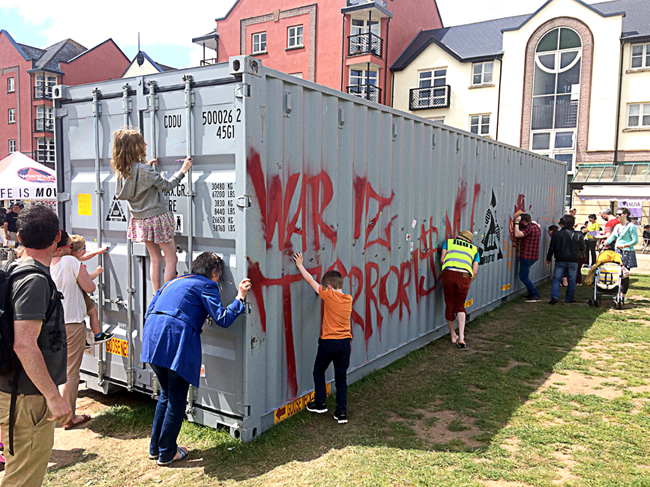 The graffiti that now covers the container was done by vandals without the control or permission from the artist or ADP organisers. When permission has been sought (particularly by those claiming to be artists) it has been denied. 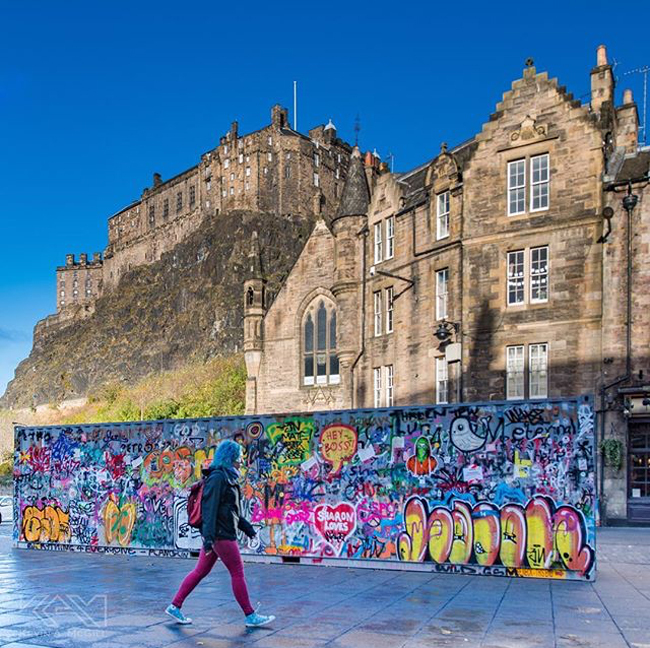 The ADP policy is that vandalism will be tolerated but not art. If anyone disagrees with anything written, pictured or stuck on the container, or finds anything unacceptable or offensive, they must take it upon themselves to change it. The artist and ADP organisers cannot and do not take any responsibility for anything written, pictured or stuck on the container. If they see something they don’t like they may change it. Just as anyone else can. The original ADP Riot Tour started on 23rd April 2016 and visited 36 riot sites around the UK before Christmas Day 2016. 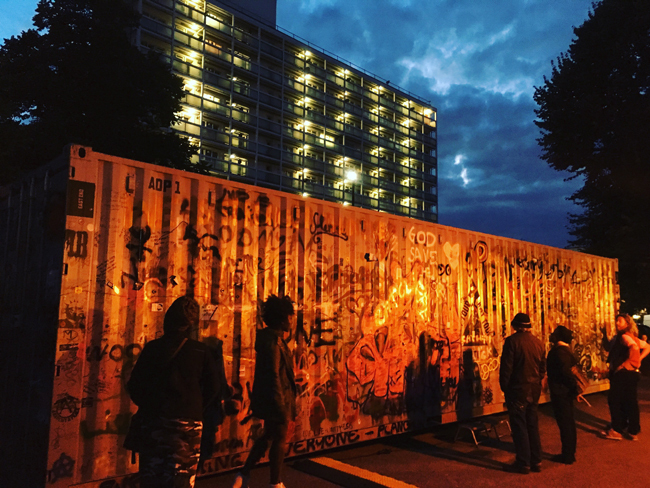 During the 2016 ADP Riot Tour the container was sometimes left switched on and unattended for days in some of the most hostile areas in the UK. At other times it was switched on and attended for only a few hours per day in shopping centres and suburban gardens. Since its creation in 2013 and by the end of the 2016 ADP Riot Tour, over 1 million people had seen and born witness to the ADP. The last site of the 2016 ADP Riot Tour was at the Panacea Museum in the Garden of Eden. The END TIME was prophecised for 00:23 hrs on Christmas Day when all things would end. The 2016 ADP Riot Tour ended on Christmas Day at 00:23 hrs but the END TIME – the end of all things did not happen. Since then The ADP Riot Tour organisers have had a major rethink and now the ADP Riot Tour will continue. First into Europe and then the rest of the world until the end of time. The ADP can only be shown on the site of, or in the context of a dystopian past or a utopian future. The ADP must always be shown for free. The ADP is appropriate for small children, old people and anyone of any age, gender, culture and sexual/political/religious persuasion. It does however contain some swear words, police on police violence and other pleasurable sights. Some parental, socio-political, philosophical and moral guidance is advised. The ADP can be viewed at any time in any weather conditions, but bright sunny days are the enemy of the ADP. Optimal viewing conditions are after dark in a hostile urban/suburban/rural environment. No one must ever dictate, pronounce or try to explain the full meaning of the ADP. It can only be seen and discussed, not known. For more details of the UK tour in which The ADP travelled to over 35 stops to commemorate historic riots please visit the L-13 archive site.